﻿When stringed instruments are employed, it is often an indication that the protagonist is somewhat mature. It is an unwritten law that sooner or later every rock, jazz or folk musician will bathe in soft tones for once. 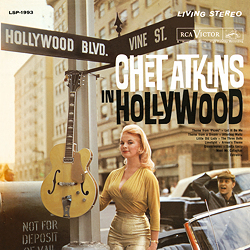 Chet Atkins, however, was light years away from his artistic zenith, came up with a wealth of ideas and was in a great position with regards to recording facilities when he set down his Hollywood album in 1959. Two years earlier, “Mister Guitar” had become boss of the newly founded RCA Studio in Nashville. Here he recorded several records, which reflected his ideas of an appealing, catchy Nashville Sound as an answer to the declining rock and roll. The Hollywood numbers were by no means dynamite movie tracks or showstoppers. Dennis Farnon’s delicate, lush arrangements rather more pay homage to the maestro with his no-frills art of playing. The gentle Italo evergreen "Santa Lucia", Chaplin’s beautiful "Limelight" with its violins and the time-honoured "Greensleeves" – all of them flawlessly performed – are a real pleasure for the ears. Atkins greatly admired the superb string orchestra and two years later he re-recorded the album using the tapes from the Hollywood session to create this new version.